This was a nice project for Machine Shop Ltd, completed over Christmas 2013. 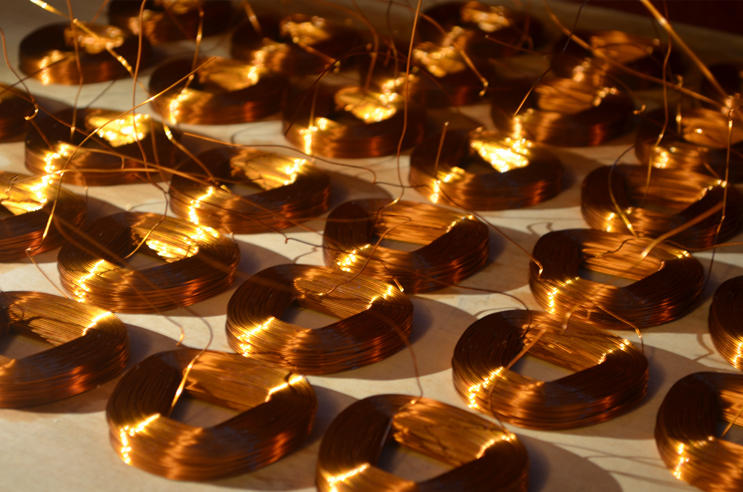 Around two hundred copper coils, to be built into a number of hand powered electrical generators for the Edinburgh International Science Festival. Teaching science to kids is important. The project was an interesting balance between automating the process as much as possible, but also not getting too distracted from completing the job. I initially considered using a lathe to wind the coils, with a laser tachometer set to count the passing of a strip of reflective tape, but using a stepper motor seemed a better idea in the end. 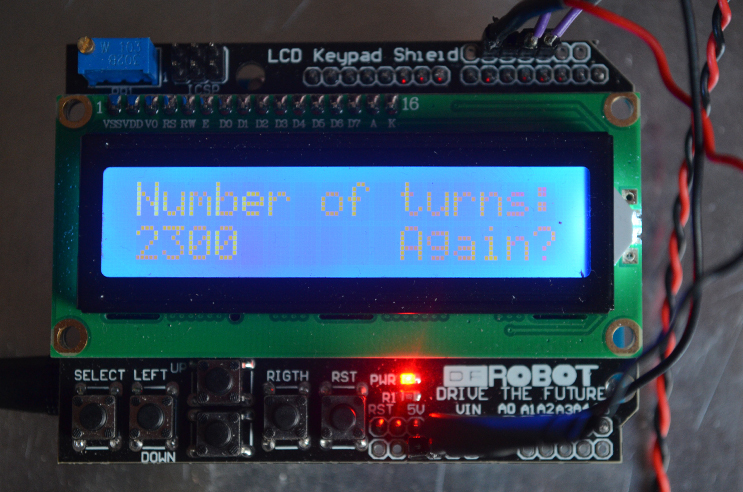 An Arduino Uno was set up with a keypad and LCD menu system, so that it was easy to enter the number of turns, speed of the motor and ramping characteristics. The motor turned off automatically after reaching its target number of turns. The wire has to be fed on by hand, but a light warns you when there are 10 turns left. 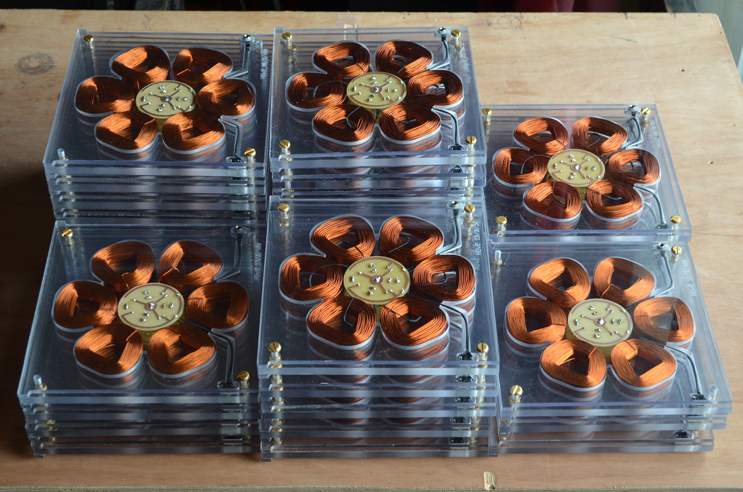 Groups of six coils were fixed into a square cartridge-type arrangement, for use with generator kits to be assembled and investigated by children. When a handle is wound, a disc with inbuilt magnets is turned past the coils, and a current is generated. 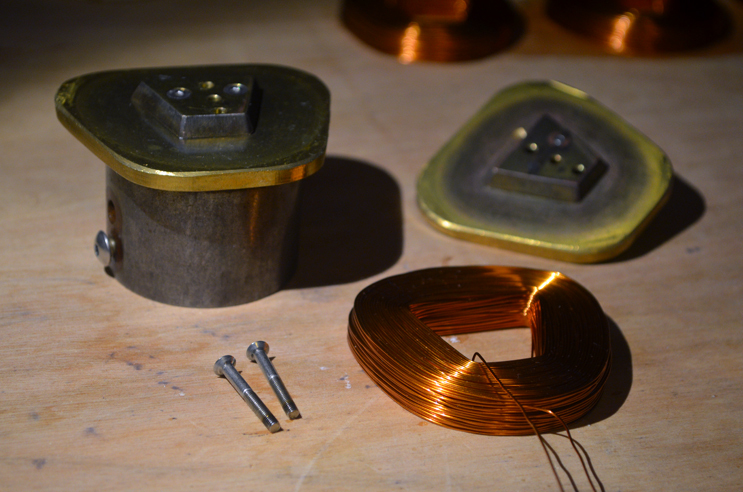 Experiments are conducted with different amounts of magnets and different wire thicknesses, and the results compared with an ammeter. Machine Shop carried out the generator design and build - my involvement was limited to winding the coils and wiring them up. The final winding setup. The coils were wound on the right hand shaft of the stepper motor, and then transferred to the other end of the long bar to be heated. 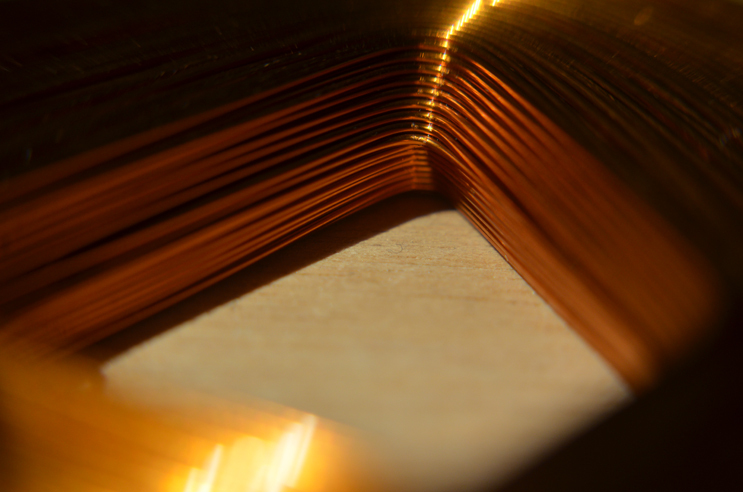 The wire was a special type designed to be baked in an oven to stick the windings together, or you could apply a current to heat up the adhesive coating, or use a heat gun. Winding the coil took 2 minutes, heating the coil took 5. 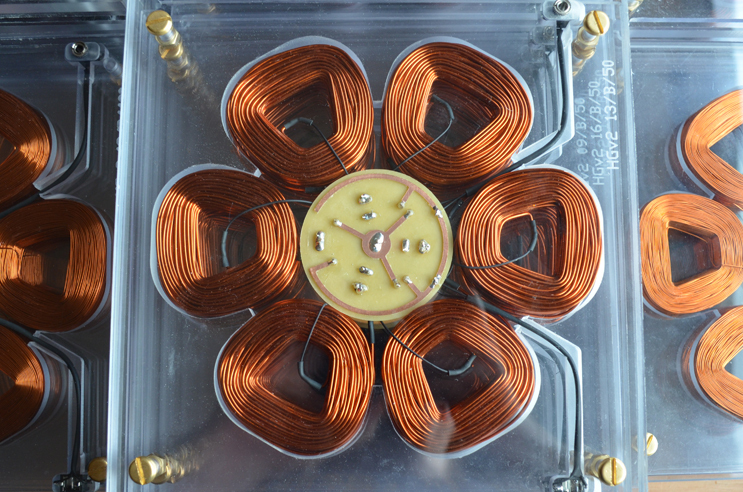 A set of 6 coils could be made in just under an hour. 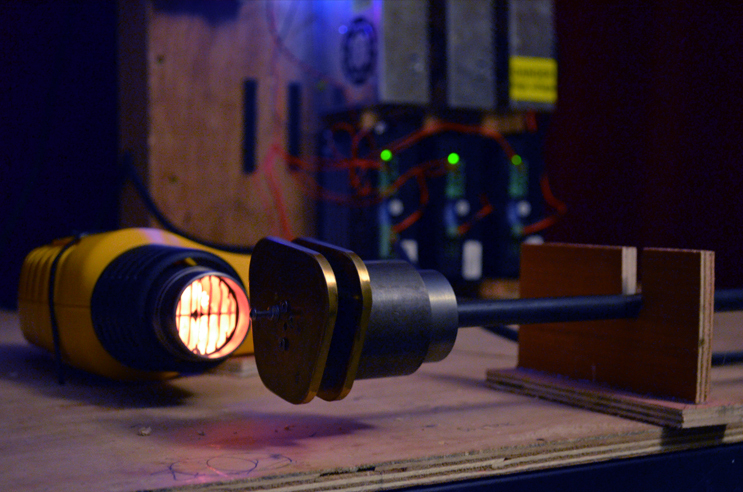 After the coil has been heated for a preset amount of time, the heat gun switches off automatically via a relay. 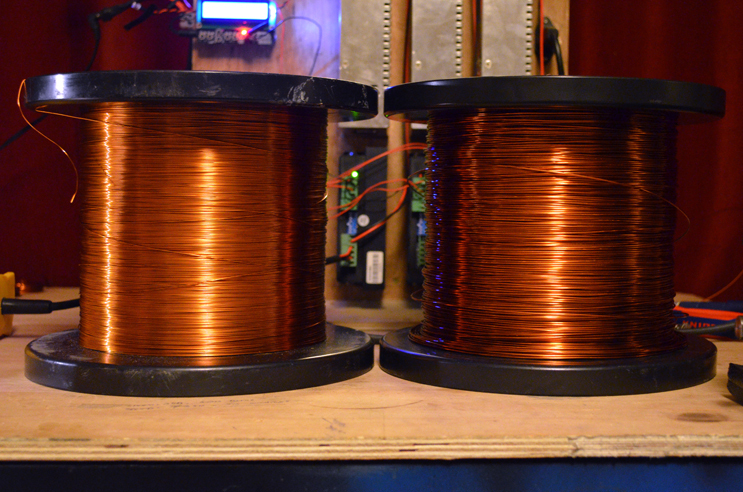 The actual turns were 400 and 80 in the end - the 2300 in the photo was just for an initial test using thinner wire. 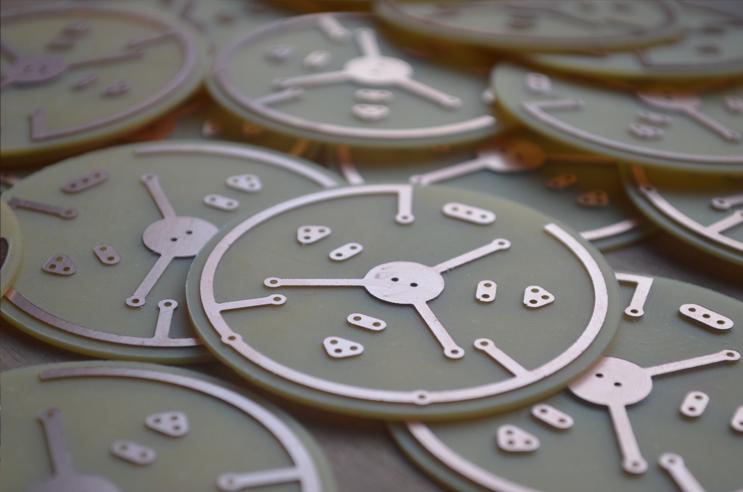 PCBs made by Patrick at Machine Shop, created by CNC-ing copper clad boards with a 1mm cutter. 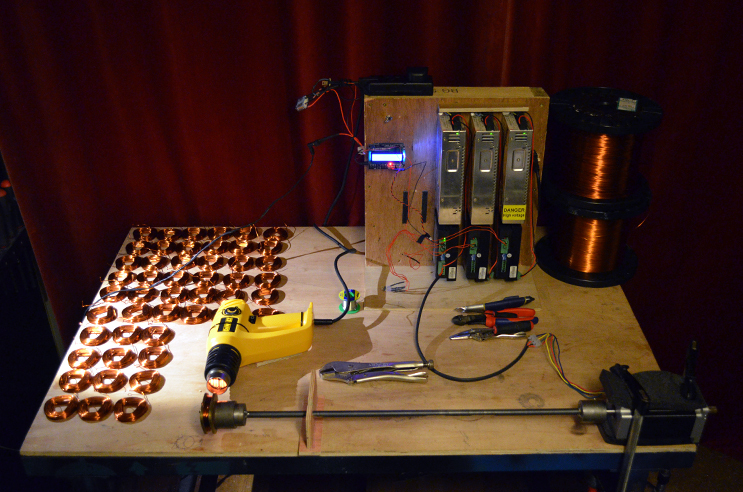 The PCBs held 6 diodes that converted the output of the coils to DC. The photos on this page show all the nice end results. I have uploaded photos of the mistakes here.